​​HOUSTON - When Houston developer PMRG was vying to buy a five-acre site near Greenway Plaza, it promised the seller it would save the live oaks at the southeast corner of Buffalo Speedway and Richmond. Those trees now provide shade for a one-acre park in front of PMRG's new 18-story office tower, one of several new office buildings in this area close to both Greenway Plaza and Upper Kirby. PMRG's building, 3737 Buffalo Speedway, is 55 percent leased. As it looks to fill up the remainder of its building, the developer faces stiff competition with other new buildings nearby that are also trying to fill space amid the energy downturn. Houston-based Midway is developing Kirby Grove, a mixed-use project with high-end office space and multifamily units around a new park in the process of being restored. The Regions Financial Center at 3773 Richmond, an 11-story building housing Regions Bank, was also recently completed. The PMRG site will eventually have a hotel next door as the second phase of the project. High-density residential was once an option for phase two, but now that market is overbuilt. 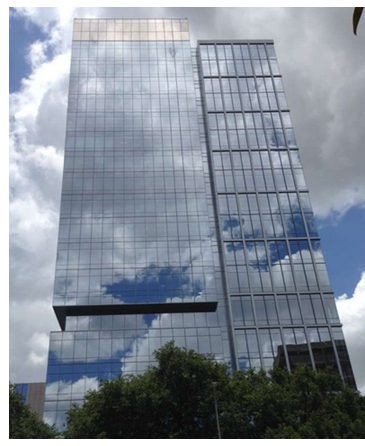 PMRG did not disclose the development cost of the nearly 400,000-sf office tower, but the Harris County Appraisal District values it at $90.2 million. The sixth floor houses amenities, including a large conference space and a fitness room with shower facilities. ​Check out the latest information under Houston's Office Market Research.